From attic to attic, for almost 150 years. Finally, someone shook off the dust, took the twine from around the 2,000 handwritten pages, and started reading what the man who was considered the patriarch of the large Davis family had written. My wife’s mother was named after him. But she hated the name because most people considered Sydney to be a man’s name; and she was right. But if she had lived to read what Sidney Davis had written in that bundle of pages, she would have thought differently about sharing that name. He served in the 6th U.S. Cavalry during the Civil War. He was in the battles of Manassas, Brandy Station, Antietam, and Gettysburg among others. 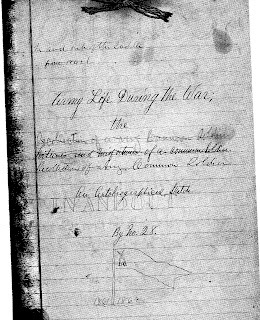 They were Confederate snipers and came very close to causing those 2000 pages never to have been written; to say nothing of what it would have done to the present day Davis families. It happened about 3 blocks from where my house is now! And, of course, there’s always the possibility that it was one of MY ancestors who was shooting at him! I grew up hearing a lot of stories about those damn Yankee soldiers and their horrible treatment of southerners, particularly in South Carolina where my people were from. Stealing food was one of the most common complaints. I’m sure there were many instances of that, and worse.. Reconstruction was an awful time in this country’s history. Sidney Davis called himself “a common soldier.” But his words tell a different story. 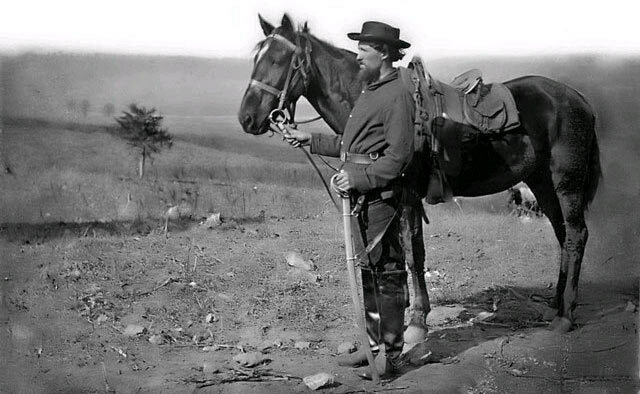 As a cavalryman conducting mainly scouting and picket duty, He was often hungry, sometimes not eating for days, riding through the southern countryside, but would always courteously ask the residents of the farmhouses if they had any food that they would sell him, and he always paid them accordingly. On several occasions, he discovered poor families who were in dire need of food themselves, and he would return and share with them what he was able to buy from nearby farms. ”The ride from Gordonsville to Richmond was devoid of interest. There seemed to be an endless monotony of pine forests and lonely fields. Few words were spoken that night. The men were utterly exhausted from want of food and water and being crowded together so long without a chance to straighten their limbs in sleep. I managed to secure a seat on the end of a car beside one of the guards…a tall, lean, lank man, 45 or 50 years of age, with long reddish hair and whiskers…and was as comfortable as circumstances would permit. About midnight I felt the guard lean heavily upon me, and from his hand slipped the dreaded musket. As it fell I seized it, and thus prevented its loss. The man was sound asleep. My first impulse, now that I had an enemy in my power, was to push him off suddenly between the cars, and have him crushed to death; but it occurred to me that such an act would simply constitute a cowardly murder; then the vision of a family in tears rose vividly before me. I awakened him, gave him his gun, and cautioned him playfully as to his duty as a soldier. He seemed very grateful, and said he was completely worn out from fatigue. For a few moments he sat up, and then settled back again sound asleep, and I once more caught the gun as it fell. 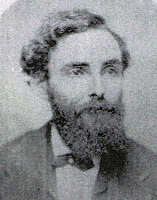 Sidney Davis spent 3 months in the Confederate prison at Belle Isle, after which he was swapped back to the North. He was in the last group of prisoners to be swapped from Castle Thunder. The rest were sent to the notorious Andersonville prison. Then, because of a government paperwork snafu, Davis was held prisoner by the Yankees for four more months. 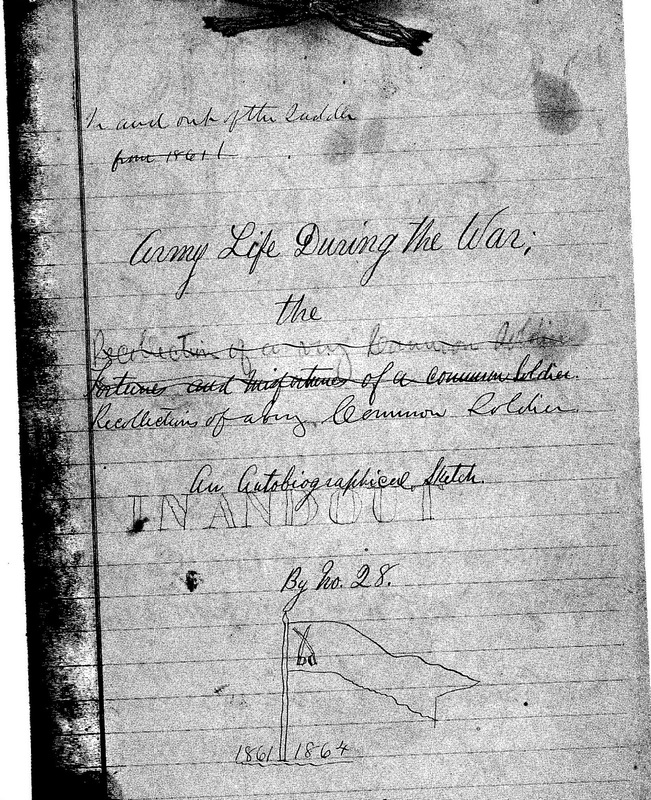 This is but a small snippet from Davis' manuscript, which he completed in 1870 obviously hoping that it would be published. To his disappointment there were no takers. My guess is that not enough years had passed by then for the public to be interested in reading about such recent events.. The only books that were in demand were by Generals, not privates. Davis was a good man. A patriotic man. He never knew his mother, but discovered accidentally while in service that she had sold him when he was very young for $35... and he had grown up as an indentured servant.... to a kind man whom he had always thought of as only a friend of his father. "...but stay away from the liquor cabinet"
"Enter and sign in please"
"...and all the ships at sea"